A "partial take" on the Beach Boys Golden Oldie "Sloop John B". 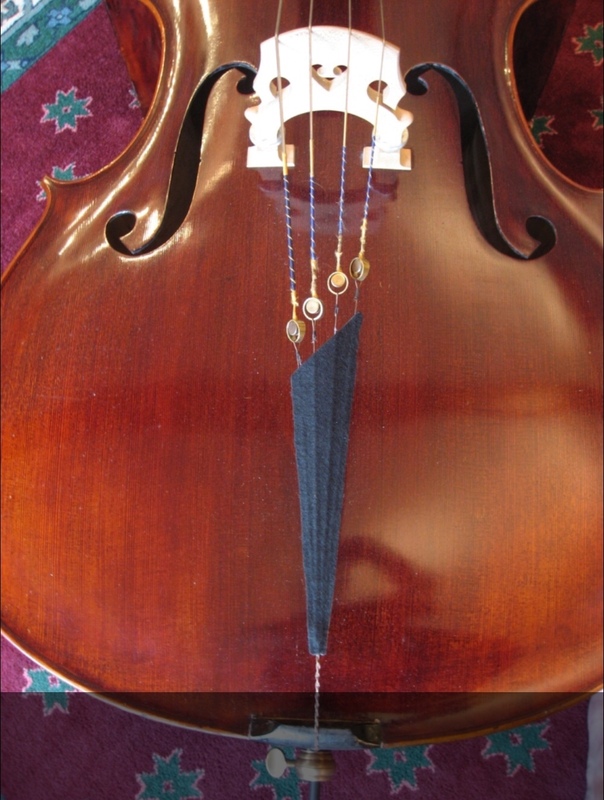 Played primarily for testing the sound and setup of octave strings on my Fiddlerman Concert violin. I may be making some adjustments to the bridge grooves to improve the overall sound - at the moment, the bridge slots have not been deepened, so the fatter octave strings are sitting "high" on the bridge.... we'll see - it's all an experiment! @BillyG That really sounds good, and I enjoyed it. I'm not sure what "octive strings" means. Apart from the "missing" low C2, the remaining G2, D3, A3 are in the normal cello range - although the overall tonal quality will never sound anything like a cello ! Just a lot of fun, and gives a different / another sound canvas to play with ! @BillyG sounding good! Like the acoustics. Good to know its not affecting the bridge.. Your making me want to give these a go. @BillyG Nice sound Bill and really nice playing. Is the reverb all natural from the room or did you add some? I've been thinking of adding some to my recordings through VideoPad, but have been doing most of my recordings with Debut because of it simplicity. 🙂 Thank you folks ! @Bob - I added some reverb in an attempt to move the overall sound somewhere towards that from a "larger bodied instrument" ( LOLOL ) so you're not really hearing the true sound. I too use VideoPad for recording, but what I then do is detach the audio, take it in to Audacity as a .wav file, process it there, save it, then import the result back into VideoPad - it also give an opportunity to use Audacity's noise-reduction tool which I find pretty good. Thanks for the demo BillyG, interesting tone, well played tune. Thank you @Mark - yes it is an interesting tone. The strings - probably due to their mass - take a bit of "work" compared to normal string to get the bow hair to properly engage with the strings - and short little 16th's etc can be"difficult" to get them to sound properly (like the bow is off the string, or on to the next note, before it has had time to react). @billyG Very nice! It definitely takes more work with big fat strings. If you find a viola bow, I will be interested to hear the difference. Watching you, you looked like you had a light bow hand, like when you play your regular fiddle. In cello, I use the weight of my arm to put the pressure on, you could try that too. Oh - BTW this is the G2 ( not the D3 I was talking about, but it is similar ) - clearly it is way too high on the bridge groove. @BillyG and others. A cautionary note regard the bridge. I would think that the lower tension of the large strings would require a larger amount of clearance between the string and the fingerboard than “normal” strings. Increasing string notch on the existing bridge may well cause buzz. I just purchased a 16-3/4 Tertis style viola that I bet would sound fantastic with octave strings, but I would likely require head muffs to play the “Rex.” I would play it with a cello bow. Is there a delay between bow initiation and sound? If so, a marvinusa type of ultra low mass tail stock may speed up the process. Typical with longer thicker strings Irv. Perhaps with a higher action it would react a bit quicker. @Irv - yes, thank you for the feedback, appreciated. Indeed, the G2 particularly, has a HUGE lateral vibration under "enthusiastic" playing :), and at the moment (original bridge) doesn't actually buzz on the neck - but - I sure take your point, especially once the grooves are deepened. I had never actually considered a low mass tail stock - good point ! I'll see just what the groove correction does first - hopefully I'll get away without having to carve a new bridge to raise the strings a tad, and then investigate a lighter tailpiece - thanks again ! I'm not sure if that would apply in this case, @BillyG but @Irv recently suggested I put a sliver of something under one of my bridge feet to temporarily raise my action and see if I liked the acoustic result. I'm not sure what material Irv suggested I use. Irv? I had no idea there was such a thing as octave strings. Thanks for sharing this. Looks like a fun thing to get involved in. You could record two parts one low and one higher. I agree with others who said is has the hint of cello in the tone. I had no idea there was such a thing as octave strings. Thanks for sharing this. Looks like a fun thing to get involved in. You could record two parts one low and one higher. It is a fun thing indeed - and although (as you will have read in the thread) to "get the strings really working properly" there are a number of issues to be aware of. I finally got around to doing this - I was curious to investigate the fiddle's response, in particular to the low strings (the G2 and D3) which are of course below the normally expected frequency-range the (acoustic) fiddle is designed for. As you can see - although a very complex curve - it does exhibit a type of "band-pass" characteristic. What it shows is that frequencies in the range of around 200Hz to around 10KHz are variously affected, some being "lifted" (in volume) more than others. Frequencies outwith that range are highly attenuated, effectively the fiddle itself is not "responding" to them, so they will be present to be heard, but at a significantly lower level. But - yeah - although obvious now - it took me a few minutes to explain the following spectrum - taken from playing the octave string G2 on my 4/4 fiddle. OK - before I post that - for those who don't get the physics involved - let's go back a step. Observe that at the far left there are two peaks - the leftmost one is PROBABLY fan noise/vibration (the mic was on the table beside the laptop). Other observations - playing down on the G and D on the octaves, I can easily feel the vibrations through chin and shoulder. Obviously the energy is going somewhere - but where it is NOT going is into the fiddle itself to be radiated out as sound energy.